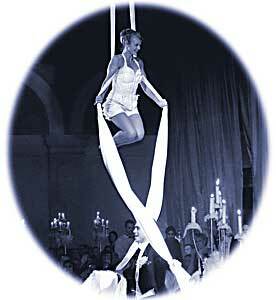 A tissu duet - cascading through the air. Poetic solo vignettes blended with smooth synchronicity are the key themes of this beautiful duet of grace, eloquence and inner strength. Desireé Kongerød was born and grew up in Norway. She competed in gymnastic and rhythmical gymnastic before she moved to London to study dance at London Contemporary Dance School and Laban Centre for Movement and Dance. Since then she has had a successful career as a circus performer and a contemporary dancer touring throughout Europe, Asia and the United States working with, amongst others, Yolande Snaith Theatre Dance, S.O.A.P. Dance Theatre Frankfurt, The Flying Dudes, The Wrong Size, Bolli Darling and Cirque du Soleil. "Thank you for your amazing performances at our Billingsgate Christmas events. They were a huge success and we had so many complimentary comments regarding your act. The entertainment most definitely set the mood for the evening and got the party started, and everybody enjoyed themselves immensely thanks to yours truly setting it off with a BANG!"